This rendering shows a type of cellular membrane protein known as a delta opioid receptor (purple) with a compound derived from a naturally occurring peptide (orange, blue, red) bound inside its “pocket.” The peptide compound shows promise as an alternative to powerful painkillers like morphine because it both activates a powerful pain-relief response and suppresses unwanted side effects. The bound structure was fully mapped in atomic-scale detail using SLAC’s Linac Coherent Light Source X-ray laser. Scientists at the SLAC National Accelerator Laboratory are paving the way for a new generation of pain relievers with reduced dependency. Researchers have long sought alternatives to morphine – a powerful and widely used painkiller – that curb its side effects, including dependency, nausea and dizziness. Now, an experiment at the Department of Energy’s SLAC National Accelerator Laboratory has supplied the most complete atomic-scale map of such a compound docked with a cellular receptor that regulates the body’s pain response and tolerance. “This work will provide a solid basis for the design of a new generation of pain relievers with reduced dependency,” said Vadim Cherezov, a chemistry professor at the University of Southern California who led the research at SLAC’s Linac Coherent Light Source (LCLS) X-ray laser, a DOE Office of Science User Facility and one of the brightest X-ray sources on the planet. The experiment is highlighted in the February 16 issue of Nature Structural & Molecular Biology. Morphine is an opioid – a drug derived from opium poppies. It works by docking with opioid receptors in cell membranes, triggering signals that act on the body’s nervous system to relieve pain. There is a whole class of opioid painkillers prescribed for various conditions, and abuse and dependency is a growing problem in the U.S. According to the Centers for Disease Control and Prevention, the sale of opioid pain relievers rose 300 percent from 1999-2008, and more than 12 million people in 2010 reported using prescription painkillers without a prescription or “for the feeling they cause” rather than a medical need. In the LCLS experiment, scientists studied a promising alternative opioid compound derived from a peptide – a chain of amino acids naturally produced by the body. The compound is designed to work as a powerful pain reliever while suppressing drug tolerance, in which an increasing dosage is required to achieve the same relief. Researchers docked this compound into an opioid receptor, and then used LCLS to explore the bound structure. The results provide the clearest picture yet of the complex binding of the opioid compound with the receptor. Scientists said it will aid in designing pain-relieving drugs that allow a more controlled response by the body while limiting adverse reactions. Opioid receptors are one of a class of cellular receptors known as G protein-coupled receptors, or GPCRs. GPCRs are targeted by an estimated 40 percent of prescription drugs because of their key roles in cells’ signaling and response; they are also involved in regulating mood and nervous system responses and enabling vision, smell and taste. GPCRs are notoriously difficult to study because they are delicate, residing in a fatty environment in cell membranes. Also, the favored method to study proteins is by forming crystals for study with X-rays, but many GPCRs are difficult to crystallize, and in some cases researchers have only been able to produce small volumes of crystals that are too small for study using conventional techniques. The incredibly bright X-ray pulses of LCLS allow researchers to study very small crystals in natural temperatures and conditions. The receptor-docked opioid samples studied at LCLS had earlier been studied in a frozen state with another X-ray source, called a synchrotron. The structural details revealed at LCLS differed from those earlier results, which researchers said may be due to the more natural conditions of the samples used at LCLS. In the LCLS experiment, conducted in February 2014, researchers prepared tiny crystals – each millionths of a meter across and containing many copies of the opioid bound to the receptor – in a toothpaste-like gel that simulates the receptor’s natural environment. Then they oozed a thin stream of the gel into the ultrabright LCLS pulses. Each X-ray “hit” on a crystal produced patterns of X-ray light that allowed researchers to fully map the structure. The LCLS result is one of just a few examples of a peptide-GPCR interaction mapped at high resolution. These types of interactions are not well understood because they are more complex and difficult to study than the simpler interactions of GPCRs with smaller molecules – like a hand fitting into a glove, versus a simple lock-and-key fit. 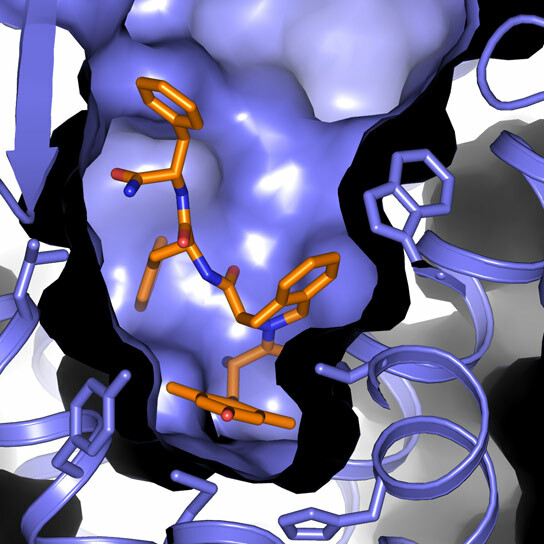 But this fuller binding mechanism could aid in developing improved drugs. In addition to researchers from the University of Southern California and LCLS, other collaborators were from the Scripps Research Institute; Arizona State University; Free University of Brussels in Belgium; University of North Carolina Chapel Hill Medical School in Chapel Hill, N.C.; DESY lab, University of Hamburg and European XFEL, in Germany; and the Clinical Research Institute of Canada. The work was supported by the National Institutes of Health, National Science Foundation, Helmholtz Association, German Research Foundation, and the Federal Ministry of Education and Research in Germany. This animation shows a specialized jet, designed for use at the LCLS X-ray laser, oozing a thin stream of toothpaste-like material into X-ray pulses. This jet can be used to study delicate crystals containing biological proteins. Be the first to comment on "Painkillers with Fewer Side Effects"